Skinner family. 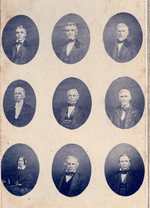 9 small oval portraits of Skinner family members. Handwritten note on back, "Cynthia Skinner Walker, lower left. Skinner family. 9 small oval portraits of Skinner family members. Handwritten note on back, "Cynthia Skinner Walker, l..